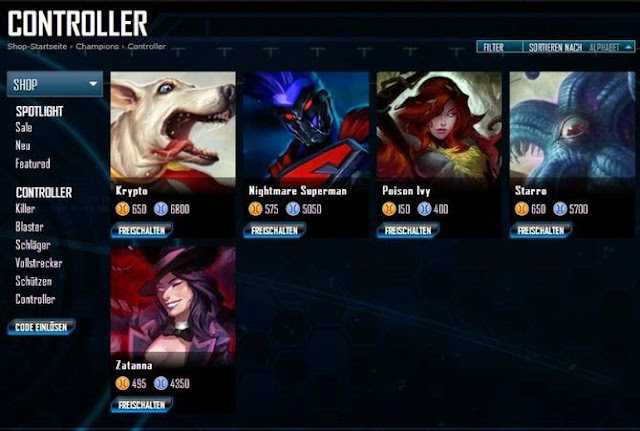 In Infinite Crisis, there are 34 different champions, which you can buy with Merit or Crisis Coins. They all have different abilities and play accordingly different. Active skills have a cooldown after use. Only when this is over, they can be used again. The ultimate skill is recently released, is the strongest skill, and has by far the longest cooldown. The passive skill has mostly to do with the auto-attack. It has no cooldown. The stolen superpowers can apply any champion. Also it has a cooldown. Are the class shooters similar. They use their power and skills in Ranged rely rarely on their base attack! Killer put the Assassin is in Infinite Crisis. You should come out of nowhere, causing high damage quickly and then disappear again. Ongoing struggles represent their weakness! The skills of thugs related to the proximity to their enemies. They are adept to use basic attacks and skills. They are at a disadvantage in long-range combat! Make the "tank" in this Moba since. Executors are designed to insert a lot of damage. And you should too! Its real purpose is to draw the focus of their enemies upon themselves to protect their team members! Sagittarians are often designed to take advantage of their base attack, so as to cause permanent damage same. This damage should be increased by attack speed and attack damage! They also provide a good support function! Set the "Support" and should not therefore suitable for direct combat. They'll be able to support team members well, heal them or give them a sign! A controller should never be alone on a main road (Lane) go!